Once we have received your inquiry by email we will study your CAD files. and we will make a quotation within a 2-3 days. (We accept IGES/STEP/Parasolid/.Prt files ). usually within 3-4 days. If you have a 2d final we can also make a rough estimation, but before tooling we need 3d cad files. Our engineering team can covert 2d files to 3d files. Based on your annual estimated production quantities, product life cycle and product material, we will determine the right tool steel and cavities for you. And of course we will give you a fair tool price and part price. After you have accepted the quotation we will study thoroughly your 3d cad files and where necessary change these for an optimal injection production. Within 3 days we will present you a Mould drawing. On the mould drawing you will find several side views of the to be injected part or product. Also you will see the number of cavities you have ordered. Important mould parts such as the ejector pins, the sprue gate will or hot-runner will be discussed. Once the mould drawings are accepted, we can start buying tool steel and standard tool parts. 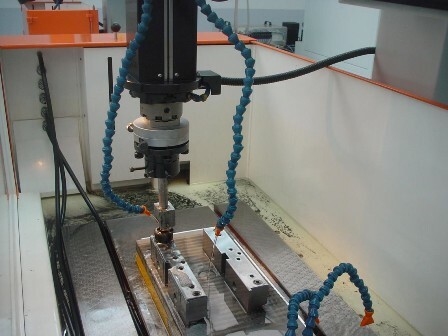 We will start the cnc maching and EDM-ing of the tool. The time to finish the manufacturing of the tool depends on the complexity of the injection mould. Usually we have a lead time of 5-7 weeks. But in case your project is urgent we offer rapid tooling services ( 3-4 weeks) , We can even produce it faster by RTVmolding, using silicone molds. Once the tool is completed we will make a test shot and send you the first out of tool (T1) to your address! for more information you can also visit our other website!